I'm not a big baseball fan. Sure, I can enjoy the atmosphere of the ballpark and the thrill of actually being present at the game but you will never catch me watching it on TV. I just never found the dynamics of the game as intriguing when sitting on the couch, but you wanna know what I could sit on my couch and watch all day that concerns baseball? 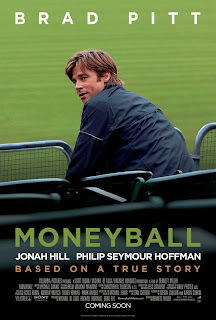 "Moneyball". Going in I expected good things, Brad Pitt is a movie star, but more importantly, the man is an honest, gifted actor. As Billy Beane, the manager of the Oakland A's he is faced with the loss of three key players and a tiny budget as compared to some of the bigger franchise teams. Beane has to make some difficult decisions and chooses the route that goes against everything baseball scouts have done for years. Pitt commands the screen as Beane and is completely deserving of the Oscar talk that has been swirling around the project. This is an underdog story, but one that doesn't take on the sensational aspects of the story most movies would exploit. Like the story it is telling, the film goes against expectation, not relying on set pieces, special effects, or big dramatic scenes. It is a simply told, linear story that chronicles a mans effort to do something he truly believes in when the rest of the world is laughing at him. check out their newly assembled team. It is in the pre-season trading game that Beane comes in contact with Peter Brand, a Yale graduate who studied economics. Beane sees the reliance his Cleveland equals place on Brand and in a great scene where Beane approaches Band and intimidates him to the point of confession we see the wheels begin to turn in his head. In what might be the oddest pairing ever, Pitt is aligned with Jonah Hill who shows real promise here as he stretches his comedic chops to a more cut and dry role that asks him to restrain. He plays it right and he plays it well. 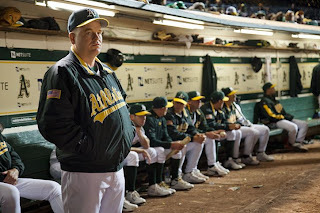 While Pitt is the anchor of the film, Hill proves to be a worthy wunderkind that is the real reason for Beane's success. Beane was looking for a new way of thinking and Brand was searching for someone to listen. 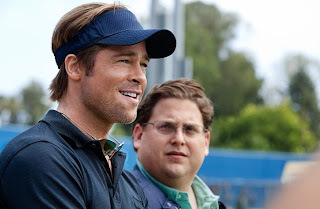 It is a match made in heaven and to watch these two men drool over stats and computer analysis of players that no one wants, that are underrated or simply throw the ball funny creates one of the most intriguing films I have seen this year.This is one of the biggest surprises of "Moneyball". by the decisions his manager is making. You may go in expecting a baseball movie, but in reality the sport itself is serving as a backdrop for a story that boils down to the business that goes on off the field. Don't worry, it's just as entertaining, and for a passive fan such as myself, it is all the more exciting. What this means though is that we are left with a tremendous amount of talking. Lucky for us Steve Zaillian is credited with the screenplay ( Schindler's List, Gangs of New York, American Gangster, and the upcoming Girl with the Dragon Tattoo) as well as Aaron Sorkin helping out who is known for his quick, witty dialogue. It may seem recognizable if you saw last year's "The Social Network" but both writers are able to draw us in with the logistics of the business and the skills it requires to garner what you need while at the same time defining these characters and what makes them good at what they do. Beane is a man who has been burned by the system of picking individual players on their promise. He was a high school all-star who had everything going his way, who's head was filled with the fact he was good enough by the same scouts and managers he is now surrounded with in Oakland. He knows that Brand is right in his theory, he knows that it will pay off just as much as if he were to try and replace Johnny Damon, the upside is that it could work even better. "Moneyball" is a movie about strategy, it shines in brief moments of comedy when sharp conversations are exchanged over the phone in the midst of the trading game and shines even brighter when we feel the tension building as the A's close in on the longest winning streak of all time. The supporting cast is stacked with players like Philip Seymour Hoffman, robin Wright and Chris Pratt who makes all kinds of leaps here with limited screen time. Still, this is Pitt's movie and he owns it, strutting around as the man with everything to prove and even more to lose. His self doubt so big that he can't even watch the games in person. It is this man, and his ideals and dreams that drive this experiment. The desire not only to win, but to change the game completely and the reasons why is summed up perfectly by a late in the film pep talk and job offer from the Red Sox owner. "Moneyball" has a few flaws in that it is a bit longer than it needs to be and features a few scenes with Billy's daughter that feel necessary but underdeveloped and not enough a part of the story that it leaves the mark on his day to day or for that matter the conclusion that the makers claim it to have. But like the players Beane and Brand pick to play on their roster, this movie surprises you over and over again with how good it is and how interesting this odd subject matter can be. It is not just an inspirational sports film, but a movie that is smart and cheer-inducing. You will definitely cheer, but probably not for who you expected to.